No, that’s wonderful to hear. I’ve said this before in past interviews, but I like hearing about friendship stories in the industry and how these collaborations continue to build up as you work on more projects. Smith – Just to add one more thing to this. The crew who did Mary Poppins Returns and Into the Woods have got a real camaraderie and an incredible shorthand amongst all of us that I think Rob referred to it as his sort of family in that sense. Not just Michael and I, but all of us: sound designers and editors and assistants and everybody have been through this a few times together and we’ve got an incredibly good sense of each others aesthetics and communication. It’s great. Part of what makes [Rob Marshall] a great director is he knows that he’s going to get the best out of people because we’re all working together, efficiently and collaboratively, in a happy place. And if we can all do that together, we’re going to get to the place that he needs to get to better as well. No that’s right. And people always say “oh, you’re just making movies,” but at the end of the day these are huge investments that can get stressful, so having those positive relationships definitely makes it more streamlined and relaxing. As I said above, Mary Poppins Returns is different in that it’s a sequel to a beloved classic. 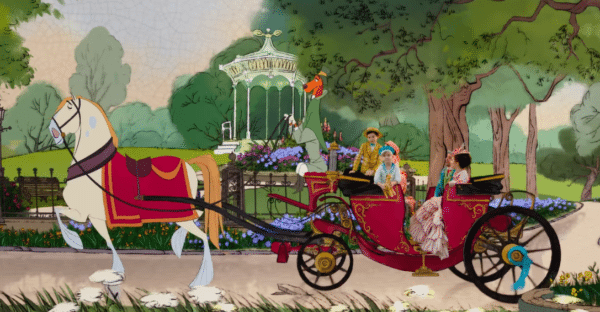 Sound of course has changed significantly since the first Mary Poppins came out in the ‘60s, but was there a notion or request on your guys’ part to make the soundscape identical to the first? Cause I know the audio crew are sometimes given requests to stick to a specific layout with regards to period pieces to prevent the creation of anachronistic sounds. And I don’t think we ever discussed it. For me particularly, I didn’t want to get all crazy and hugely dynamic. It was a very traditional score with a very traditional feel to it, so I think it was important for us to fundamentally just serve the story of what was on the screen rather than trying to get elaborate or tricksy with the sound or music. It was more about certain story and being traditional….I hate to use the word vintage, I’d rather use “classic.” We wanted to give it a classic feel, and not stray too far away from how that might have felt. Because obviously we’ve gotten an immense amount of technology that allows us to convey that differently now, and I think it does- if you put the two movies back-to-back in a theater it would be made how different they sound. But fundamentally, the aesthetic is very similar- it’s a classic feel and it’s something that we just arrived at, it never got discussed. I’m sure some of the sound designers for the chase scene like Eugene Gearty and Renee Tondelli went through this as well. It’s kind of a classic feel. It’s not too in your face. It feels appropriate to the image. And it’s something we all sort of gravitated to rather than any real sit-down discussion. Keller – I think the movie lent itself to it, pictorially, where you look at it and it never even crossed my mind to go crazy sound-effectsy; to go “oh, look at that cool sound effect that’s behind me.” Because it’s emotional, and from an image standpoint it’s always for the period. It’s not like a spaceship movie where something explodes behind you- the movie just doesn’t lend itself to it. That’s why I believe everybody did their job and it was pretty much clear what it should be. Yeah, Mike’s absolutely right, we just arrived at it. It’s not the speaky-outy, “oh, look at these cool sound effects that surround here.” It’s a character-piece more than anything. Smith – I think it’s a testament that the stars of the movie knew what it was so clearly, so distinctly, that we all just got in line and went “oh, it’s this movie, it has such a clear identity.” It was an understanding of what it was that we all went “ah, this is the way that we’re going to go.” And that attachment to our collaborative spirit too that we all just knew what it was. It just kinda happened that way. That’s intriguing to hear. This certainly isn’t one of those sequels that’s purely riding on the coattails of its predecessor, but it does have that influence. And having that groupthink mentality amongst the crew to honor the original’s atmosphere is fascinating to hear. Keller – And if you look at the horse race, even there we tried to be subtler than bombastic because it’s kids, it’s kids being chased but it’s still borderline scary. And it takes a long time to craft that, to not just throw all the music in, all the sound effects in, and consequently turning it into a wall of noise. It took weeks and weeks to figure out what we were going to play here and there to make it exciting-sounding, but not overwhelming. Right, and I hope Mary Poppins Returns resonates with this generation of kids as much as the original did. But actually speaking of that horse-race scene, one thing I found interesting to read was, and I guess this was kind of obvious in retrospect, was that, for those kinds of the songs that were heavily reliant on visual effects, you guys had to work with animation that wasn’t fully rendered. How difficult is it to mix when you don’t have the full scene available? Is it a process where you have to keep coming back to it as the visuals get more and more finalized? Smith – Yeah, you go to these scenes many times, and often you need to do a heavy lift first to get all the bits kind of standing up. And that in itself can be quite a tough process, so often it’s good to move on from that and go somewhere else in the movie, and then come back and look at it again. Having a little bit of break time between things on any creative work makes it easier to do a full overview. With the animation involved, it’s kind of useful because you are slowly distilling the sound track. You’re making some structural choices over and over again. So it’s going to be bringing the whole soundtrack into focus in time with the way the visuals are slowly coming together. It’s an interesting thing that’s not entirely destructive. I think actually having the big blocks in place early on and getting in position early on is useful because, as it becomes more detailed, so your soundtrack starts becoming more detailed because your choices are becoming more honed. When they say they haven’t got everything ready, it’s actually a useful thing because you have to just keep a tone and adjust what you’ve done and improve it. So what could’ve been a bad thing is a good thing. And that’s not on just this movie, it’s really every movie these days. A lot of movies have visual effects and I feel it’s consistent through that now. 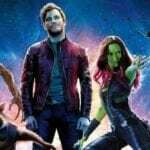 Keller – Yeah, we do it in layers where we go through and work on the material that we feed, especially on the sound effects and foley side of things. And then, as Mike said, our normal workflow was we go through a reel in a day with the crew: Mike, I, the music department, sound effects department, and dialogue department, and we just chisel away and get through a reel in a day. And the next day we’d play it with fresh ears for the picture editor and whoever wanted to chime in, and then, in the afternoon, most of the time Rob came in and he saw it with fresh ears and eyes. Once you’ve sat in a room and you’ve just listened to the same thing over and over and over, you kind of get numb to it. So it’s fantastic, especially when a director comes in in the afternoon and hears it with fresh ears. Then we finesse. And then, because VFX aren’t ready, you step away and you go through the same process on the next reel. So after say 10 days or so you’ve done your first pass through the movie, and then you go back to reel one. And at that point we got a full loop played of VFX or hand-drawn animation and were consequently able to refine and add to it. And interestingly enough, your first instinct when you go through it is normally the right instinct, because VFX gets so busy these days that if you start adding a sound effect to everything, it becomes messy again. 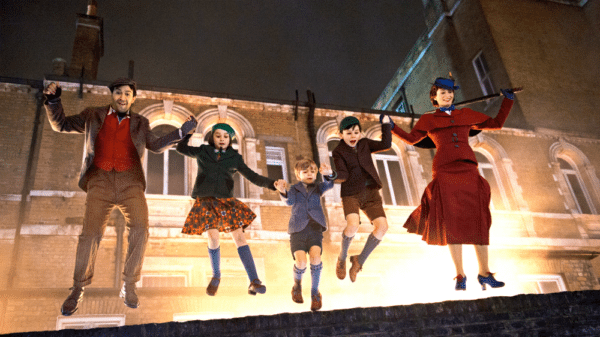 And the chase scene in Mary Poppins Returns is again a prime example where, if you put ember sound effects onto every little spark that you see fly, it just becomes too noisy, too loud, too busy all the time. And so sometimes we back off and now we see twice as many embers flying by so maybe it was just fine the way we had it before with sounds on only half of them, to give the music a little chance to play that fine string line that’s important. So it’s a pick and choose. You don’t need to have a sound for everything you see. That makes a lot of sense, and I’m definitely glad that, though it’s a tiring process, it’s something that you’ve come to embrace, especially with regards to first impressions. And yeah, it’s not just Mary Poppins Returns- tons of movies that you both have worked on have extensive visual effects. You two have been in the industry long enough to hopefully adapt to it at this point. Keller – Well it’s actually a feel thing because, as you work on a scene, you’re 100 percent convinced that it’s genius and the best it can be, and then you play the movie as a whole and you’re exhausted and you can’t really put your finger on it as to why that is. And to me, it’s over-stimulus, you know sonically and visually. And that’s why my approach is you don’t play everything all the time or loud. And Iron Man 3 was a prime example where we had a path and it was brilliant and then we sweetened the hell out of it because all of a sudden there were 4000 more things flying around. And then we sat back and watched it and we all agreed that we broke it and that it was just too much material in the speakers. It was just more exciting and more fun to watch with a little less. And the only way you see that is if you sit back and watch the movie as a whole as an audience member and not as somebody who is working on a section of the movie right now. Right, that’s true. Having an outsider’s perspective is essential to not getting sucked up into your own world. But thank you again gentlemen, I definitely hope you both continue to have successful careers. Smith – Thank you so much! Keller – Hey awesome, it was nice talking to you! Flickering Myth would like to thank Mr. Smith and Mr. Keller for sitting down with us. 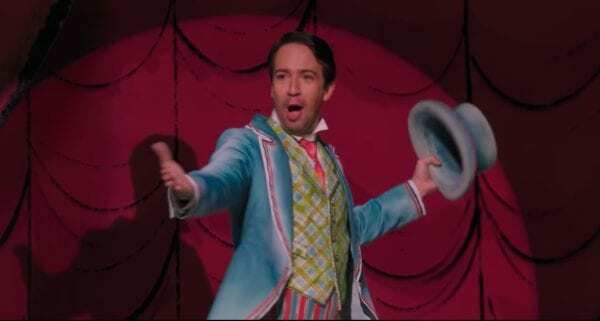 Mary Poppins Returns is out in theaters now. Special thanks to Nathalie Retana of Impact 24 PR for making this interview possible!